Your visit begins when you book an appointment. Please ring 020 8337 4448 and we will do our best to arrange the earliest possible time that is convenient. When you come for a check-up, we will thoroughly examine your teeth, mouth and gums, taking x-rays where required. If treatment is necessary, we'll explain what needs doing and some options and costs and listen to your wishes on the treatment which is best for you. This initial check up costs under NHS arrangements at April . Any further treatment may be undertaken straightaway or at a future date, depending on what's involved and your and the dentist's availability. For any additional work, we'll prepare a personal plan for your prior approval. For further appointments, we follow guidelines issued by the National Institute for Health and Clinical Excellence, ensuring the necessary frequency to help keep your teeth and gums healthy. We have surgeries on the ground floor for wheelchair access. We also have a special parking bay immediately outside the front of the Practice for disabled patients. 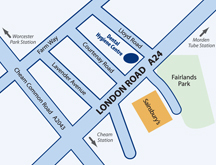 We are situated on the A24 London Road, opposite the access road to Sainsbury's and almost next door to McDonald's. 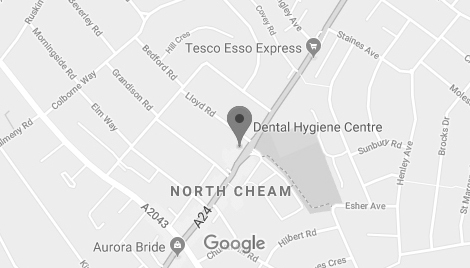 By Tube : From Morden or South Wimbledon, take Bus 93 (heading towards North Cheam) or Bus 293 (towards Epsom General Hospital) and alight at North Cheam Sports Club (Stop: HD) on London Road. The Practice is on the opposite side, about a minute's walk. By Car : There is ample parking nearby and Sainsbury's Car Park is directly opposite the practice. We also have a special parking bay immediately outside the front of the Practice for disabled patients. We are committed to providing a website that is accessible to the widest possible audience, regardless of technology or ability. We wish to enhance the accessibility and usability of our website and in doing so adhere to many of the available standards and guidelines. If you are not happy with any aspect of our service, we need to know. Please contact in confidence the Practice Principal at the Dental Hygiene Centre. We will do our best to help. Should you still not be satisfied, then you may raise the matter with the Health Service Ombudsman or for private treatment the Dental Complaints Service. Our practice is registered with the Care Quality Commission (CQC) http://www.cqc.org.uk/ , the independent regulator of health and adult social care services in England. Please call us during surgery hours as early in the day as possible to arrange an emergency appointment with us.